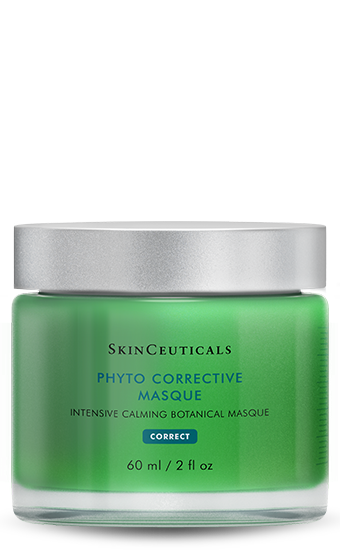 Phyto Corrective Mask contains highly-concentrated botanical extracts, a calming dipeptide, and hyaluronic acid to intensively soothe and replenish temporary skin reactivity. This intensive calming facial mask cools on contact, comforts skin sensitivity, and restores natural radiance and smoothness. Phyto Corrective Mask has been clinically tested post-procedure to effectively reduce visual redness and discomfort. Phyto Corrective Mask can be applied as a leave-on, rinse-off, or overnight treatment. Apply a generous coat to clean face, chest, or neck avoiding eye and lip area. Allow mask to remain on for 10-15 minutes. Rinse with cool water if desired. Use 2-3 times a week or as needed.